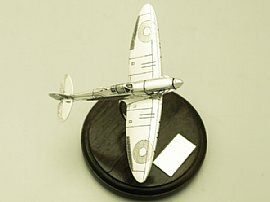 This fine vintage Elizabeth II presentation model has been realistically crafted in the form of a Spitfire Mk I* aircraft. The cast sterling silver model has been embellished with engraved and applied decoration reproducing the details of the spitfire’s distinctive components and classic design. The model is displayed on a plain rounded wirework style support; the push fit support is firm in situ yet securely allows for the model to be rotated to the desired position. The presentation model retains the original mahogany base with a vacant rectangular silver cartouche to one side. * The Spitfire is a single-seat fighter aircraft originally designed in 1936 and employed by the British Royal Air Force (RAF) until 1952. This vintage sterling silver model is a very good gauge of silver, fine quality and in excellent presentation condition. The engraved decoration is very sharp. Full hallmarks struck to the underside of the horizontal stabiliser to the tail of the plane are all very clear.